IT’S TIME to raise your intensity in the gym now the business end of the season is here! You may be feeling a bit knackered with the odd knock and niggle, but if you put in the hard yards now, just think of the silverware you could be lifting in a few weeks. 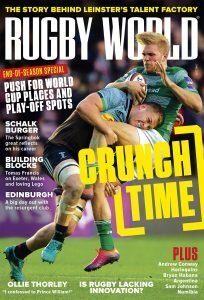 John Dams, Harlequins’ Head of Performance, has designed a workout in the May edition of Rugby World to help you out, and below are two of the exercises. See how the pros do them, and then give them a go!